Illinois’s population is 15% Hispanic, the tenth-highest Hispanic population share nationally. New Mexico ranks first with 45%. 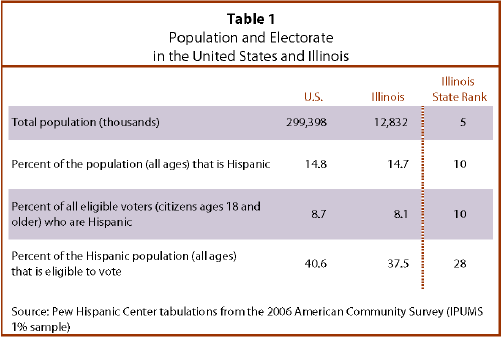 8% of eligible voters in Illinois are Latinos, the tenth-largest Hispanic eligible voter population share nationally. New Mexico ranks first with 38%. 38% of Latinos in Illinois are eligible to vote, ranking Illinois 28th nationwide in the share of the Hispanic population that is eligible to vote. 35% of Hispanic eligible voters in Illinois are ages 18 to 29. By contrast, 22% of all Illinois eligible voters and the same share of all U.S. eligible voters are in that age range. A greater share of Hispanic eligible voters in Illinois (33%) are naturalized citizens than are all Hispanic eligible voters nationwide (26%). 30% of Latino eligible voters in Illinois have not completed high school compared with 13% of all Illinois eligible voters who have not completed that level of education. 67% of Hispanic eligible voters in Illinois live in owner-occupied homes compared with 74% of all Illinois eligible voters. By contrast, a lesser share of all Hispanic eligible voters in the U.S. live in owner-occupied homes (60%) than do Illinois Hispanic eligible voters. Latino eligible voters are outnumbered by black eligible voters in Illinois by nearly 2 to 1—708,000 Latinos to 1.3 million blacks. Latino eligible voters are younger than white and black eligible voters in Illinois. 35% of Latinos are ages 18 to 29 compared with 19% of white eligible voters and 26% of black eligible voters. Nearly one-third of Latino eligible voters in Illinois are naturalized citizens compared with only 5% of white eligible voters and 2% of black eligible voters. Fewer Hispanic eligible voters in Illinois (67%) live in owner-occupied homes than do Illinois white eligible voters (79%). By contrast, only 48% of black eligible voters in Illinois live in owner-occupied homes.